The Liberal Arts Action Lab, a partnership between Capital Community College and Trinity College, welcomes the public to attend its open house on Friday, February 16th 2018 from 12-1pm at our downtown location, 10 Constitution Plaza. See our transportation page for directions. Action Lab Director Megan Brown will deliver a brief presentation of our work from 12:15-12:30pm, and will be available with others to answer questions. RSVP at the bottom of this page by Feb 14th to help us plan a light lunch for guests. These research teams will present their findings on the web and at a public event on Monday April 30th, afternoon time TBA. 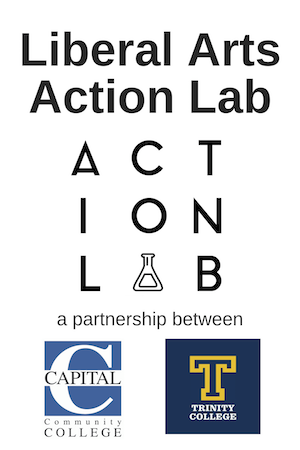 Learn how to apply to participate in the next round of Action Lab projects in Fall 2018. 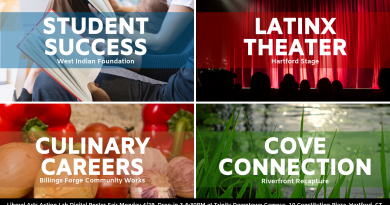 Applications are due Feb 23rd from Hartford community partners (broadly defined to include neighborhood groups, non-profit organizations, government agencies, social entrepreneurs, and others focused on the city). Applications from prospective faculty fellows and students are due on March 23rd.